My mom has 14 grandkids (and one on the way--my youngest sister's expecting her second in August!) and has made a quilt for each of them in the last three or so years. My boys got their quilts from her on Christmas morning this year. I got another picture with the whole quilt spread out but I like how you can see part of the quilt back in this one, plus my boy had a squinty face in the other photo. 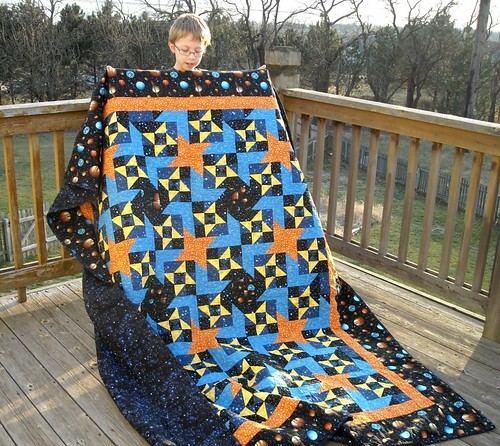 This is a really cool quilt, and big, too. He really likes it. 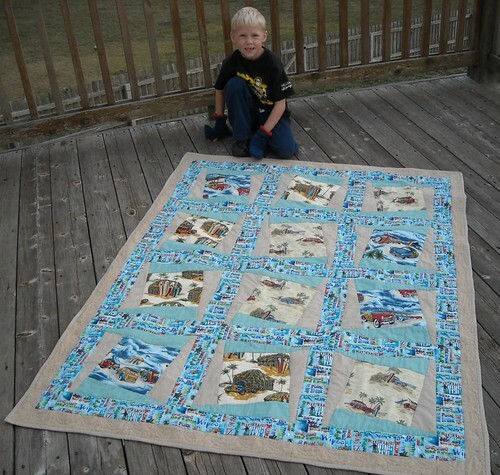 I love the different surfing fabrics in this one and the sand colored border is perfect. Both quilts turned out great, and the boys were really surprised and they like them a lot. Thanks, Mom! 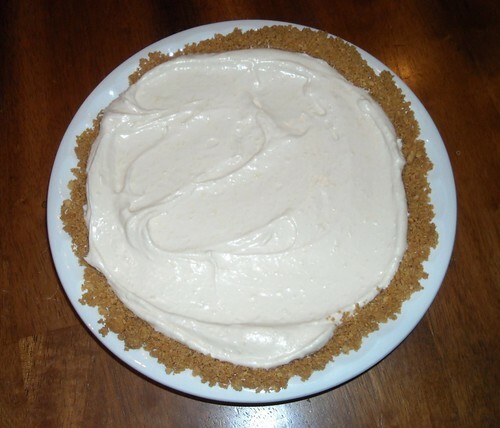 You can eat this cheesecake plain or top it with pie filling of your choice. When I was a kid we had sour cherries in the freezer and we would make a yummy cheesecake topping with those. Oh wow!! They are beautiful! Cute quilts! I really like the surfing one. My family has that same cheesecake at Xmas time! Happy New Year!! She did a great job on these quilts! What a wonderful gift. The colors on the first one are so vibrant, and the theme of the second one is fun. Your mom stays busy. These are wonderful! Fred's favorite cheesecake is one very similar. Mix cream cheese, sugar and coolwhip. One time I didn't have graham crackers, so made an oatmeal cookie crust. He loved it! So that's how I make it now. Your mom is awesome!! Lucky grandkids! !